A new commentary paper published last week in Trends in Ecology & Evolution is challenging the predominant view that our species, Homo sapiens, emerged from a single ancestral population and a single geographic region in Africa. By looking at some of the latest archaeological, fossil, genetic, and environmental evidence, a team of international experts led by Eleanor Scerri from Oxford’s School of Archaeology have presented an alternative story of human evolution, one showing that our species emerged from isolated populations scattered across Africa, who occasionally came together to interbreed. Gradually, this intermingling of genetic characteristics produced our species. Indeed, the origin of Homo sapiens isn’t as neat and tidy as we’ve been led to believe. No doubt, Mitochondrial Eve, like other humans, featured a rich genetic lineage, and the story of her species, as this new paper illustrates, did not begin and end with her or the immediate population to which she belonged. The reality, as suggested by this latest research, is that human ancestors were spread across Africa, segregated by diverse habitats and shifting environmental boundaries, such as forests and deserts. These prolonged periods of isolation gave rise to a surprising variety of human forms, and a diverse array of adaptive traits. When stratified groups interbred, they preserved the best characteristics that evolution had to offer. Consequently, the authors say that terms like “archaic humans” and “anatomically modern humans” are increasingly problematic given the evidence. Scerri said occasional episodes of interbreeding between these different, semi-isolated populations created a diverse “meta-population” of humans within Africa, from which our species emerged over a very long time. Our species, Homo sapiens, emerged around 300,000 years ago, but certain characteristics, like a round brain case, pronounced chin, and a small face, didn’t appear together in a single individual until about 100,000 years ago, and possibly not until 40,000 years ago—a long time before genetics and other archaeological evidence tells us our species was already in existence. Isolated populations came together to exchange genes and culture—two interrelated processes that shaped our species, explained Scerri. The new paper, instead of providing new evidence, provides a comprehensive review and analysis of what the latest scientific literature is telling us about human evolution, starting around 300,000 years ago. The researchers found that human fossils from different regions of Africa all featured a diverse mix of modern and more “archaic” physical characteristics. The earliest of these date back to between 300,000 to 250,000 years ago, and originate from opposite ends of Africa, stretching from the southern tip of the continent to its northernmost points. Many of these fossils were found with sophisticated archaeological items associated with our species, including specialised tools mounted onto wooden handles and shafts, and often utilising different bindings and glues. 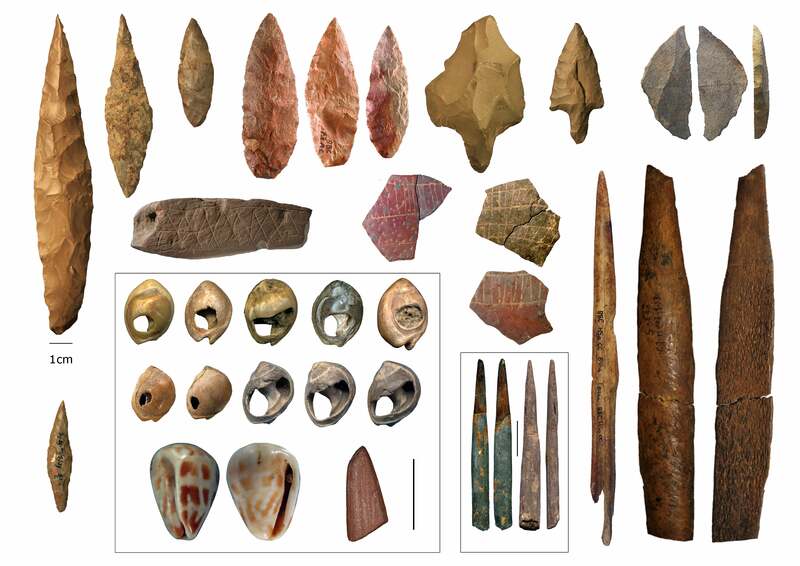 These artefacts, like the diverse fossils, appeared across Africa around the same time, and studies of their distribution suggest they belonged discrete groups. At the same time, genetic data points to the presence of multiple populations. “On the methodological side, we can also see that inferences of genetic information that don’t account for subdivisions between populations can also generate very misleading information,” said Scerri. By studying shifts in rivers, deserts, forests, and other physical barriers, the researchers were able to chronicle the geographic changes in Africa that facilitated migration, introducing opportunities for contact among groups that were previously separated. These groups, after long periods of isolation, were able to interact and interbreed, sometimes splitting off again and undergoing renewed periods of extended isolation. Scerri said this is why our species is more physically similar today than our ancestors were. Jean-Jacques Hublin, a scientist at the Max Planck Institute for Evolutionary Anthropology who wasn’t involved in the new study, said the new commentary paper is presenting what is quickly becoming the dominant view on this topic. Importantly, Hublin said, the more gaps we fill in the fossil record, the more it will be difficult to distinguish “anatomically modern humans” from more archaic forms among the various bands of Homo sapiens. Looking ahead, Hublin said the new paper should encourage scientists to document this evolution in portions of Africa, including those in which this history is effectively blank. He said geneticists also need to revise their “over-simplified models” to account for the genetic mixing.